The crochet primrose stitch is such a pretty stitch when completed and really simple to work. The end result will be a wonderful texture with a little bit of a flowery side. It would be beautiful in any project you make. This is not a tight worked stitch. So there is a fair amount of stretch to it when you’re finished. It really is quite simple. 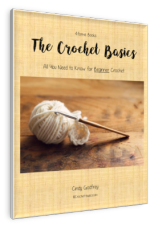 The stitches it uses are single crochet, half double crochet, and double crochet. Nothing too hard, right. 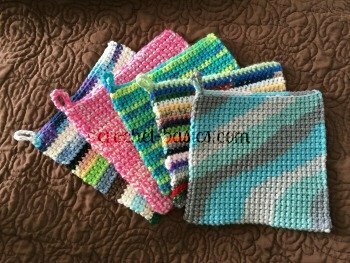 The primrose stitch is worked in multiples of 3 + 2. Just as a reminder, this means that you can work this in any number of stitches as long as you can divide 3 into that number evenly. Then you add 2 chains for turning. So, multiples of 3 + 2. In my sampler I chained 20 to start with. That’s 18 for the stitch and 2 more for the turning. Work (sc, ch 2, sc) in the 3rd chain from the hook. Ending with 1 hdc in the last chain. Ending with 1 dc in the top of the turning chain. Ending with 1 hdc in the top of the turning chain. Repeat rows 2 & 3, 4 more times for a total of 11 rows. That’s 10 rows of the worked stitch (rows 2 & 3) and the one prep row that we started with makes 11. When you're using this stitch in your projects, row 1 is basically a preparatory row to get you started and then rows 2 and 3 are repeated until you reach your desired length. There you have it! You've learned a new stitch. I’d love to see your projects that you make with the primrose stitch. Use the link below and tell me all about it. Show Me What You're Working On! Do you have a project that you're working on or have you tried a new stitch? I'd love it hear all about it. Please take a minute to share it with me. 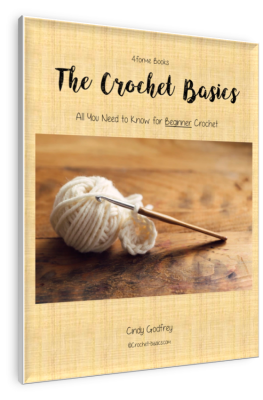 I'll add it right here to this page and you'll have your own spot on Crochet-Basics.com. What is Your Project or Stitch? Your project or stitch information will appear on a Web page exactly the way you enter it here. You can wrap a word in square brackets to make it appear bold. For example [my story] would show as my story on the Web page containing your story.